If you’re not a fan of Elmore Leonard, you should be. He’s one of the best storytellers around, renowned for his gritty realism, his succinct and highly memorable dialogue, his intense characters, and conflicts that turn audience expectations upside-down and backward before rolling those expectations down a steep hill. Twenty-six of Leonard’s stories and novels have been turned into films or television series, and you can always pick out the original dialogue because, as he memorably quipped, “if it sounds like writing, I rewrite it” and “I try to leave out the parts that readers skip” (Ten Rules of Writing). 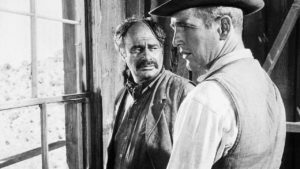 Whether you’re a fan of his early Westerns or his later crime fiction, you can never go wrong reading one of Elmore Leonard’s pieces of fiction or watching one of the dramatic adaptations of his work. “Edgy” and “unexpected” are probably two of the best adjectives to describe his fiction, although he’d no doubt object to my using so many adjectives, since he was famous for describing his characters as little as possible, letting their dialogue and their actions reveal all that was essential in their natures. The good but indecisive Mexican, the decisive but bad Mexican, the thieving Indian agent, his cultured wife, the desperado, the lady boarding house operator with a heart of gold, and the Kid. While those are, indeed, some of characters in this story, Hombre goes far beyond the Western tropes and clichés to become an examination of morality, human nature, and the struggle to survive. 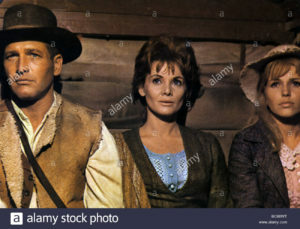 Some critics call Hombre a “revisionist Western” because it shows Indians — or, at least, a white man who was raised by Indians — in a way that’s different from the shrieking savages riding circles around burning covered wagons that Hollywood typically portrayed. But the film is not really interested in the conflict between the races, although racism certainly is a significant part of the characters’ natures and contributes to many of the film’s conflicts. 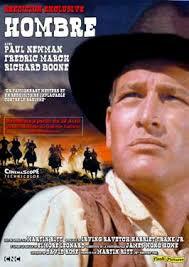 Instead, Hombre is about human conflict, no matter the race, the gender, or the age of the character. And that’s what makes this film a classic. 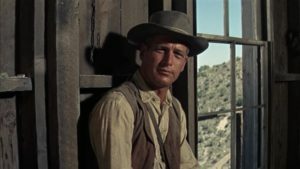 Hombre opens with a blue-eyed Indian (Paul Newman) and a band of fellow Apaches patiently waiting for a group of horses to come down to a waterhole, which they have fenced off in order to capture them. 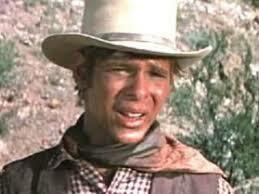 A Kid (Peter Lazer) comes down and tells the blue-eyed Indian, whose adopted name is John Russell, that Henry Mendez wants to see him about an important matter. 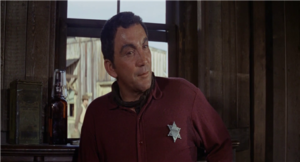 When John Russell goes to see Mendez (Martin Balsam), a half-Mexican, half-white stage driver, he tells Russell that his adopted father has died and left him a boarding house that actually makes money. Mendez encourages Russell to “accept” his own half-white heritage and take ownership of the boarding house, which would make his life easier. Mendez also encourages Russell to cut his hair so that other whites will accept him more easily. Meanwhile, at the boarding house, the woman who has been running it for years is nervously anticipating the new owner’s arrival. 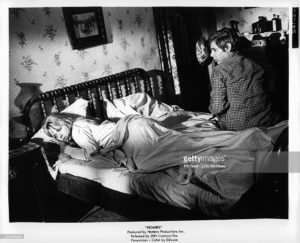 Jessie (Diane Cilento) even tosses her sheriff-boyfriend Frank (Cameron Mitchell) out of her bed, sending him back to his own room in the boarding house, since she isn’t sure how the new owner will take such “immoral” relations. She gets the house ready for John Russell’s arrival, even polishing the silver, causing Mendez to laugh, telling her that Russell “eats with his fingers,” so she’s going through a lot of work for nothing. Russell doesn’t want the silver because he doesn’t even want the boarding house. He intends to sell it, leaving Jessie out of a place to live and of an income. After she attempts to convince her boyfriend — Sheriff Frank — to marry her, she decides it’s time to leave and start a new life somewhere else. 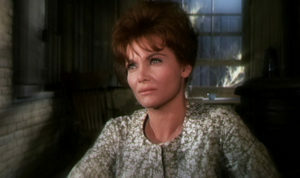 At the station, two other boarding house residents are also waiting to leave so they can start a new life: the Kid, whose name is Billy, and his wife Doris (Margaret Blye), who apparently married Billy to escape a brutal, unhappy life with her father, only to have an equally unhappy life with her new husband. She believes if they start their life somewhere else, their relations will improve, and Billy hasn’t much choice except to go along with her. While this group is waiting for the stage’s departure, an obviously wealthy woman (Barbara Rush) and her older husband (Fredric March) come into the station. When Mendez informs them that they cannot hire the stage to get to their destination in three days, Mrs Favor buys the stage, horses and all, to ensure that she and Favor are able to make their trip. 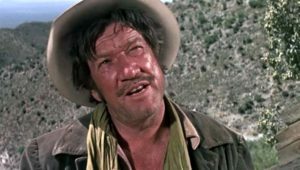 Later that night, the Bad Guy (Richard Boone) comes into the station and insists on taking one of the passengers’ places on the stage. 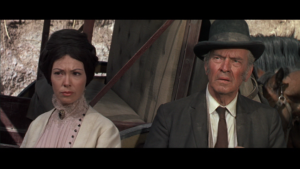 After he intimidates an army officer into giving up his seat, he joins the rest of the passengers on a journey that, rather than being merely the trope of strangers on a journey in a stagecoach who are forced to form a community, albeit a temporary one, becomes, instead, a journey that will show the racial, cultural, and economic tensions that divide everyone in the group. When the stage driver Mendez attempts to go a different route to avoid three strangers that he fears are highwaymen who want to rob the passengers, the group is attacked by some people they never expected to fear. Stranded in the desert with the money the outlaws want, they attempt to return to the town they left. The outlaws, who have a hostage and some of the water, follow the group, willing to kill any and all of them for the fortune they stole from the stage. 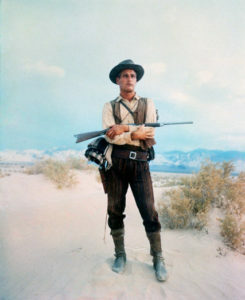 As if an abundant stolen fortune and a serious lack of water in the desert weren’t enough for a group of clashing personalities to deal with, the group members turn on each other for every reason imaginable, revealing the greed, misogyny, racism, and elitism that makes this Western more than a cowboys vs. Indians, white men vs. non-white men, good vs. evil tale. Virtually everyone in this story is selfish and ugly, everyone wants something he can’t have without hurting someone else, and everyone seems ready to betray everyone else in order to survive. Hombre is an “excellent example of how violence is more effective the less it’s used,” and the emotional and cultural violence is more important to the story than any of the physical violence, most of which, including the murders, is not graphic. With outstanding performances by Newman (John Russell/Hombre), Boone (Bad Guy), and Cilento (Jessie), Hombre‘s messages are far more brutal than its shootouts. Available for rent ($2.99-3.99 SD/HD) from Amazon (free with a 7-day trial of Starz), GooglePlay, YouTube (not available for iOS), and Vudu. Always free for Starz or DirecTV subscribers.